Moon walking but not like Micheal Jackson. Join us on a fun and fact filled Night Hike. We will hike under the starlit sky and learn the wonders of astronomy. 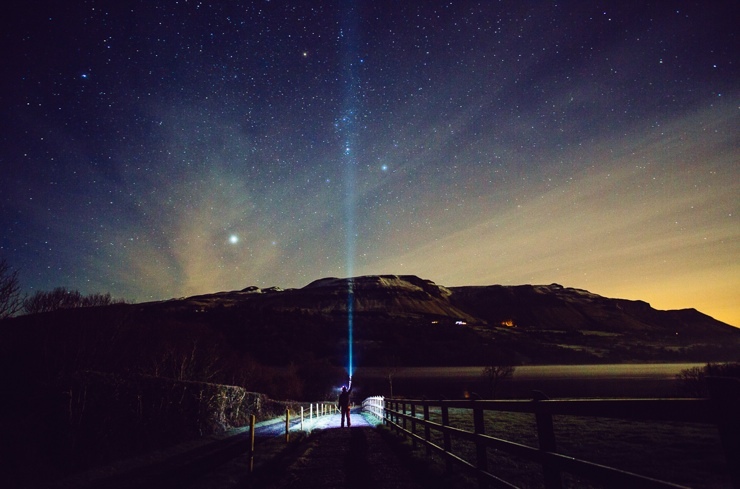 You will discover what our ancient ancestors thought about the skies discover how Star Wars really originated in Sligo and then chill out under the stars while having a warm drink. This is a great way to enjoy the alternative Sligo nightlife. Our torches will light the way through this ancient landscape that is steeped in history and astronomical connections. The lack of light pollution will also add to the occasion making the stars shine even brighter. Enjoy the twinkle of the village lights far below as you hike along the mountain tops on this after dark adventure. Expert guides will give you an information packed evening that you wont forget. Some of our scheduled hikes even tie in with meteor showers and other astronomical events so keep an eye on our upcoming events. So get in touch and books your places on evening you wont forget and enjoy the Sligo nightlife in a different way. Trip Grade: Green Our easiest tours require some basic fitness and the ability to walk for 2-3 hours on flat or easy rolling terrain.